Mr Pickles, of Bent Laithe Farm, Lothersdale, ruled the roost with his home-hatched birds, a cockerel and hen described as “outstanding” by show judge, Edward Boothman, of Silsden, who is chairman of Craven Poultry Keepers Club and vice-chairman of the Poultry Club of Great Britain. With Richard Pickles’ Craven Feather Auctions Spring champions are father Tom and daughter Selina, joined by show judge Edward Boothman, centre. Mr Pickles, who works at Bristol Street Motors in Cross Hills, breeds both Large White Wyandottes and Light Sussex bantams. He was winning his second Craven Feather Auctions championship and is also a three times reserve champion. His latest title-winning pair, shown by his father Tom and daughter Selina, 13, a pupil at South Craven School, sold for £100 to T&R Addison, of Barnard Castle. The reserve champion trio of Black Orpingtons was shown by Keith and Anne Chatburn, of Cononley, selling for £55 to W Sharp, a buyer from Lancashire. 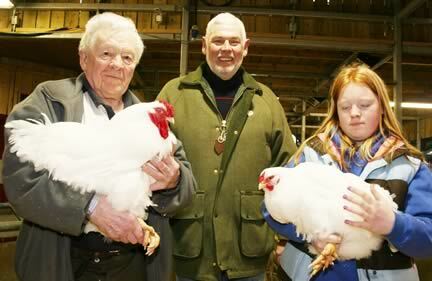 The Chatburns are also past Craven Feather Auctions title winners. Top of the pecking order on price at £105 was a pair of White Wyandottes shown by David Pownall, of Glossop, and sold to A Bailey, of Lancaster. The first prize pen of waterfowl, a pair of White Call Ducks shown by HJ Walmsley, of Pllling, made £65 when joining A Whittaker, of Clitheroe. The poultry show and sale attracted a bumper entry of 330 caged lots, along with 135 lots of hatching eggs and poultry equipment. The next Craven Feather Auctions sale is scheduled for Saturday, May 25.